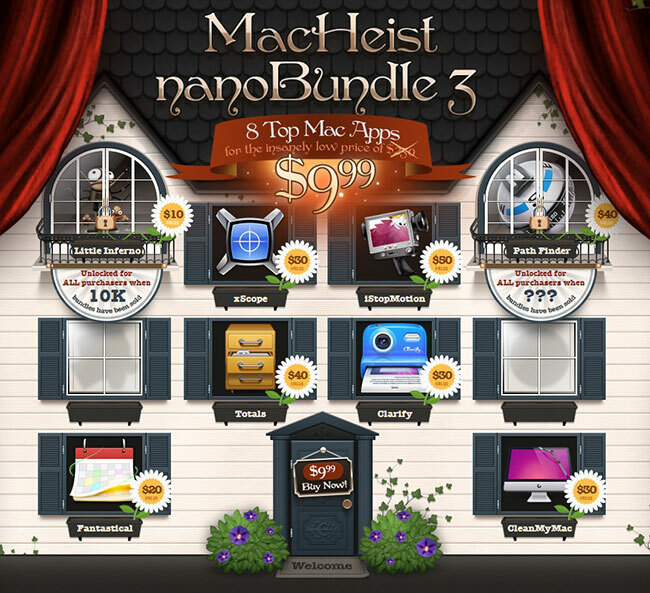 Bundle deals come and go, but MacHeist has always killed it when it comes to selling and promoting their own bundles. Today, MacHeist has resurrected the nanoBundle which they haven't offered in 3 years. 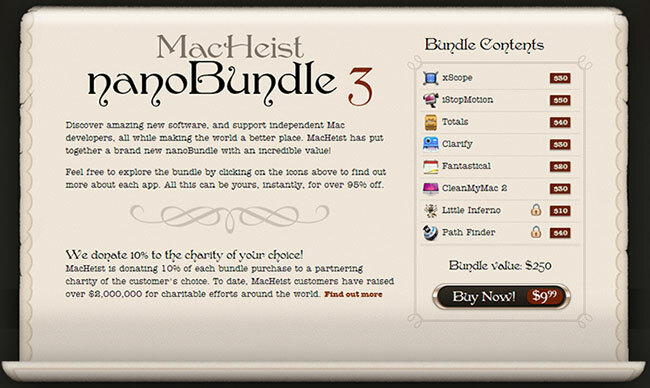 The MacHeist nanoBundle 3 is a set of excellent applications worth $250 that can be purchased for $9.99, with 10% of the proceeds going towards a reputable charity of your choice. So is it worth your hard earned cash? I’d instantly tell you yes - Fantastical is one of the best Mac apps to own and if you still haven't purchased it, now is the time. Also, if you do ANY designing and/or developing, xScope (MSRP $30) is a great app to have in your arsenal of weapons. xScope is a practical set of measuring tools for designers and developers. They’re great for aligning and inspecting on-screen graphics and layouts. We reviewed xScope last January, here's a link to the review. Admit it, you hate iCal… But you don’t have to suffer any longer! Presenting Fantastical, a neat little app that streamlines your schedule. With Fantastical, simply type in the details as a sentence and it automatically detects and schedules your event. It also acts as a hub for your reminders, eliminating the need to juggle multiple programs with different lists. Almost everyone has a favorite stop motion film, from classics like Gumby to more recent productions like Coraline. If you’ve ever dreamed of directing your own stop motion feature, iStopMotion gives you all the tools you need to create a masterpiece. What better way to spend a rainy day than creating a story, and memories, with your child and their favorite toys. If you’ve struggled to create professional looking documents in Pages or Word, you’ll appreciate the ease with which you can generate slick, customized invoices with Totals. Never forget who owes you money again. With Totals, all your outstanding invoices and estimates are tracked automatically. Clarify makes it easy to create gorgeous tutorials and how-to’s. When you need to add a bit of explanation to your screenshots, Clarify is the all in one tool to simplify the process. Use Clarify whether you need to take a new screenshot or add an existing image, annotate with an arrow or use more advanced options like step numbers, highlights or text. If you have multiple screenshots to illustrate a process, it’s easy to organize each one into it’s own step of the process and then export slick PDF documents that are easy to read by the less technologically gifted. Has your Mac been feeling a bit slow lately? CleanMyMac 2 automatically gets rid of bloated, useless files and speeds up your system. CleanMyMac 2 also has a host of other tools to help you keep your Mac in shape! Quickly uninstall apps you don’t use anymore, disable or uninstall extensions, widgets, or preference panes, and securely erase anything you don’t want anyone else to find. Excite your inner pyromaniac! Throw your toys into the fire, and play with them as they burn. If you’ve ever wished that the Finder supported tabs like a web browser, Path Finder is the tool for you. It also boasts some other features previously confined to web browsing, like bookmarking for your favorite files and folders. And if you want even more control over your files, you can take advantage of advanced features like batch renaming, file tagging, and advanced searching based on criteria. Customize your experience with the modular interface and spend less time looking for the files you need. In conclusion, with the amount of great Mac apps included, and only ten bucks, why not take the plunge, load up your Mac with some great software, and give back to the world while you’re at it? If you already own licenses for some of the software, you can always give away licenses to a friend or relative, who’d be more than happy to take that extra copy of Fantastical off your hands. The support forums at MacHeist provide excellent help, and rest assured that you should get the unlocked applications Little Inferno and Path Finder by the end of the sale. I also see 2 empty, silhouetted windows left as well so MacHeist is bound to add two more apps. While I was completing this post, MacHeist sold almost 2000 bundles and raised $2,000 for charity.